Place dried chiles in a large saucepan and cook and stir for 2 minutes or until fragrant. Place in a blender with raisins, cocoa, spices, 2 cups broth and tomatoes; puree until smooth. Place back in saucepan. Melt butter in a large nonstick skillet. Add onion and chicken and cook over medium-high heat for 10 minutes, stirring frequently. Add flour and cook for 1 minute more. Add to stockpot with remaining broth, carrots, celery, corn, squash, beans and canned chiles. Bring to a boil; reduce heat and simmer, covered, for 45 minutes. Slowly add cheese, stirring constantly and cook just until melted. 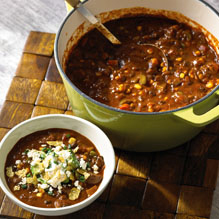 Ladle into bowls and top each serving with sour cream, crumbled Cotija and any desired toppings.